I love a challenge, I guess I am kind of known for it, but some challenges really are a challenge! 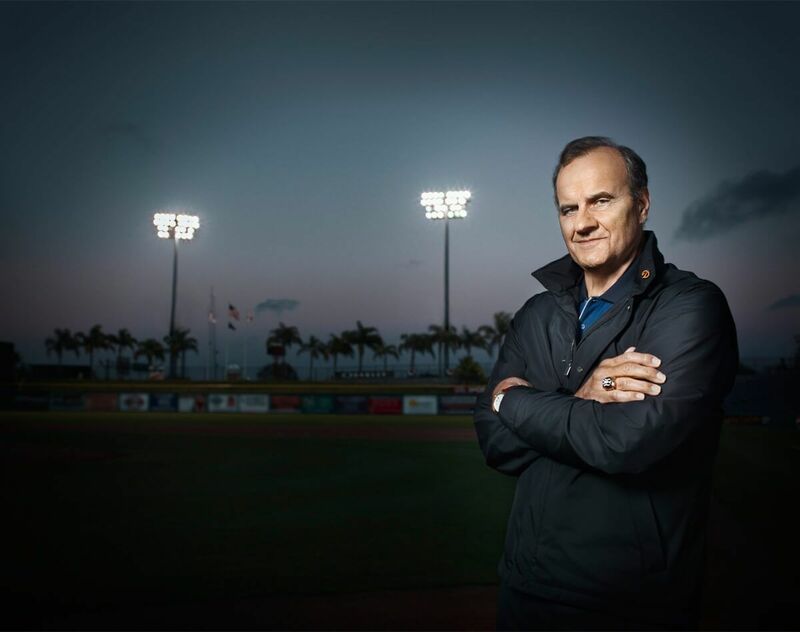 The challenge here was to find an appropriate stadium that looked like a professional ball park, during spring training on the West Coast of Florida, where talent was going to be on the free day we had to shoot the inimitable and indefinable, Joe Torre. 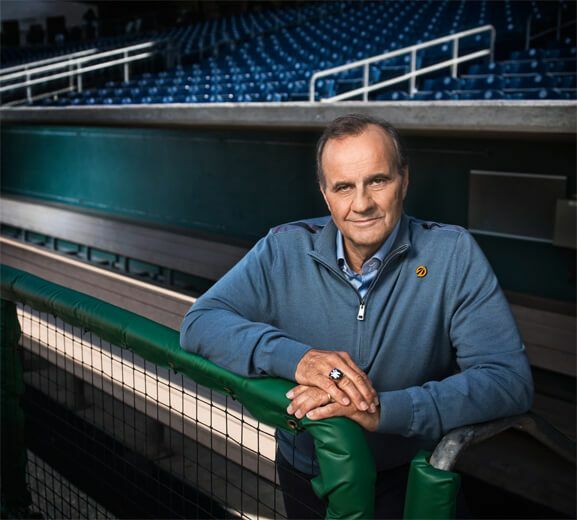 I have been a Yankees fan all my life, so the job first came as an honor, but soon the challenge of finding a stadium over shadowed the honor of the assignment! Most of the parks in the area needed a great deal of creativity to make look like a professional stadium. As an example, here in the dugout shot we had to cajole our park handler to remove a banner that went across the entire back of the dugout for some telecomm company. The outdoor scenes were littered with advertisements in the background that had to be taken out in retouching. And the key shot, the tunnel out to the field, was not covered (so it did not look like a tunnel) and had hardware and pipes all over it. To make this look and feel like a tunnel in both the stills and the video, I hung a 20 x 20 foot black ? what over the top to make a roof, unscrewed all the hardware I could, hosed the floor with water, ran smoke to give atmosphere and hung lights outside the tunnel to light the smoke. Creating the spaces was a challenge, but it was solvable. The time was also tight, so the video was created between the 3 still shots. The ultimate problem though was getting a stadium to allow us to shoot while all of their teams were training there. Everyone said no, until I came up with the idea and suggested to the client that we have Joe’s manager make the request. “Yes sir,” was the reply and, “when would you like to shoot here? 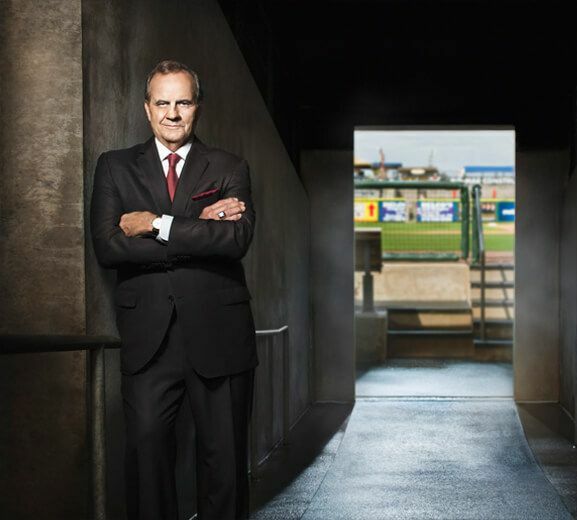 ?” We squeezed our pre-light, 3 still shot and a video spot into the few hours we had between the Phillies ending their practice (so Mr. Torre could borrow the field) and Joe needing to catch a plane that night. Now that’s respect!